Summary: The original plan for this trip was to descend into Sam's Mesa Box Canyon (SMB) below the point where canyoneering is required, hike down to the Dirty Devil River, head up river to the mouth of Twin Corral Box Canyon (TCB), ultimately climb out on the so-called "South Fork", prior to the need to do serious-to-impossible rock climbing, and head back across the mesa top to our vehicles. I had planned this trip as a 3-night, four day backpack. What a joke!! Michael Kelsey is certainly the godfather of canyon country hiking and he has done more than anyone to open up this country to hiking and backpacking by writing a series of continually updated guide books. However, on more than one occasion, we have found that the time required to cover the distances by us mere-mortal backpackers, is often three times that in which Kelsey reports he can do the hiking. If you keep this in mind, you will not get yourself in over your head. 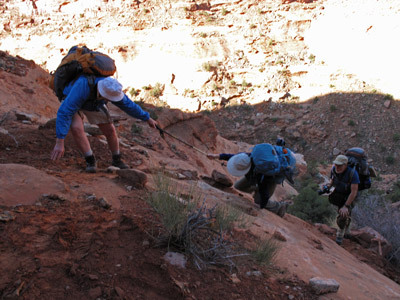 If you forget this #1 Rule of canyon country hiking, you will end up like we have a few times. This was one of those times. Normally, I would not even bother to write up this short trip. However, I realized that it could be valuable for those planning on doing the loop described above. As maybe a five night, 6 day trip……. Make no mistake: the entry into the canyon, when you compare your notes and GPS tracks, etc with Kelsey's description, is as "advertised." 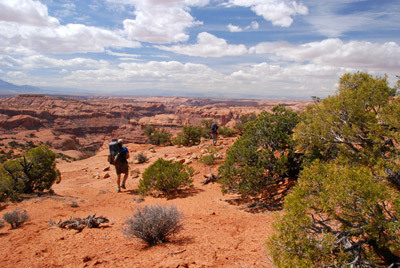 However, plan on taking a full day of hiking (7 - 8 hours) to get from the SMB Road to water near the canyon floor (note how I am describing this). And on being really tired when you get down. How to get there: The route to the hiker's entry to SMB is as Kelsey describes. Basically, just south of the turn off to Goblin Valley State Park on Hwy 24, you turn east on a dirt road. You will travel approximately 24 miles of brutal washboard. Don't plan to cover these miles quickly, unless you are planning on a realignment job for your vehicle when you get back to Hanksville. At about 24 miles, you will come to a fork in the road, where there is a big sign, with the same title as the movie that depicts Aaron Ralston's infamous time in Blue John Canyon, 127 Hours. Turn right and head south. You will drive past Blue John on this route. Interestingly, the road is much smoother. In another 16 miles, you will turn off the Maze Road. 2.5 miles down this road, there is supposed to be a vehicle track (you can see it on a topo map) that you should be able to drive closer to the exit point for Twin Corral Box canyon. Yeah, in your dreams, Fleishman!! We cruised back and forth, and were not able to find anything I would even consider taking an AWD Honda CR-V on, or even a Jeep. But to each his own. So, if you are going to do the loop, plan on leaving a car on the road, and driving further south. Kelsey suggests parking near a lone cedar (juniper) tree. Well, good luck: there are lots of lone trees out there. Better to set a waypoint ahead of time and park near there. We parked near 12S, 563786 E, 4229886 N (NAD27 grid, to be compatible with paper USGS Topo Maps). I would plan on two hours of dirt road driving. You might be able to beat that. Report: Essentially, the route into lower SMB is, in retrospect, pretty close to that described by Kelsey: you skirt the heads of two canyon arms, find the constructed cattle trail which takes you down to another sandstone layer. You stay up high across what Kelsey refers to as three minor drainages and head down. However, it is not that simple. One challenge is that not all hikers are sufficiently conversant in the layers of sandstone in canyon country to navigate by them. A second challenge is in knowing what constitutes, in Kelsey's write up, a "minor" drainage. Better he use a GPS waypoint, but I am not sure that Kelsey uses a GPS, even though affordable handheld GPS devices have been available for well over a dozen years. So here's a suggestion, make a copy of the reconstructed track from Andy's GPS. There may be some small inaccuracies, due to signal bounce, but it will be helpful to know for sure when and where to descend. Seven of us were backpacking, all very experienced. Most of us have well over two dozen canyon backpacks in our resume. We left the car park at 12:15 pm and arrived at waypoint SMB3, about 3.7 miles of hiking in open flats, about 2:10 pm. If you are looking at the map, you will note that the straight line distance between SMB3 (a planning waypoint) and our campsite is about 1.2 km. It would take us about 4.5 hours to go that distance. The reason is that the actual hiking distance, what with route finding, getting around things, is something like 3 miles. Nevertheless, 3 miles in four and a half hours is not exactly a blistering pace. It seemed to me that we skirted Kelsey's recommended descent point, and decided that there was no way we could safely descend slickrock that was THAT steep. The route finding, going in and out of small drainages, was consuming an enormous amount of time. And figuring out how to drop from one shelf to the next was both tiring and time consuming. I recall sitting on a point out over the canyon edge and debating whether we should dry camp on that point (and climb back out the next morning), or chance it and head for the bottom, IF we could find a doable descent point. About that time, Will returned from a bit of scouting, and indicated he could see the floor of the canyon and a seemingly doable route down to within a hundred feet of the a little stream of water, so we decided to traverse some more and then head down where we could. The descent is first from one small shelf to another, and then finally, you get into a boulder choked draw. That is the way down. It is very slow going. Terri has an excellent photo of the final descent route here (to the left of where our tents were ultimately set up). We landed on a small shelf about 100 feet or so above the canyon floor at that point, a little after 7 pm. The shelf (actually two of them) had enough flat spaces for our tents. So we decided to stop there. (Will would go on a bit further.) Our camp was at 12S, 557802E, 4228773N. To get to the pour-off and spring that Kelsey mentions, it was necessary to traverse some steeply sloping slickrock on a convenient seam. Will's photo shows this seam the best. It was just flat enough for some of us to cross it, comfortably or otherwise. So, the fundamental route to the canyon floor is to go thru the notch which constitutes part of the "constructed cattle trail" (waypoint 384), drop down a layer or so, and high up on the canyon walls, head downstream about as far as you can go before getting cliffed out. Head down thru the boulder choked draw to within about a hundred feet of the canyon floor to some shelves, traverse steep slickrock, heading upstream for maybe 300 meters. 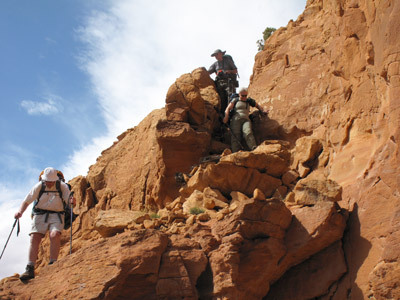 After the slickrock traverse, angle down the canyon floor right above the obvious pouroff. From that point, looking down canyon, climb up slightly on canyon left, get on rubble, sand and what have you, and go about a third of a mile before descending on very steep sand to the canyon floor and water. OK, back on the bench above the water, it was starting to push 7:30 pm, and it was overcast. We knew we were going to start losing daylight soon, and we still had no water. I decided to go get water with several of the crew, while Susie stayed behind and set up our tent and emptied packs. Retrieving water was not a simple process. We set up a "bucket brigade", by attaching a flexible rubberized bucket to our pack hauling rope. We tried to scarf up water by lowering over the lip of the pour-off into a pool below. But the bucket, even with some rocks in it, would not sink sufficiently to retrieve more than a quart at a time. Ultimately, Will, our best rock climber, downclimbed along the side of the pour-off and manually filled the bucket. Each time, Andy and I would haul it up over the lip, while Sue, Terri, and Barbara would hold out water bottles that were filled from the bucket, and use the full bottles to fill water bags and other bottles. This is not a fast process, as were trying to get over a gallon per person. Ultimately, Will would need to use the rope to climb back up, as there was too much exposure to climb up without it. Anyway, it was necessary to pack up the water and re-cross the sloping slickrock back to our campsite (Will decided to camp at the edge of the streambed near the water.) Will has an excellent photo of our re-traversing the sloping slickrock here. I returned to our campsite to find everything set up. We quickly cleaned up with a minimal amount of water and, in the dark, making sure we did not venture too close to the edge of the shelf, cooked dinner. On the morning of Day 2, it was clear that most of us were pretty wiped by the descent day. We made the decision that this would be a two night, three day, in and out trip. Will decided to day hike down canyon a bit. Several folks went to the blocking pour-off above Will's campsite. The sloping slickrock traverse was enough to make Susie decide to stay put, while Terri and I crossed the canyon at the pour-off, and in the aforementioned third of a mile, were able to drop to the canyon floor and enjoy flowing water. On the afternoon of this day, Will came back upstream on the canyon floor and hollered that he was ready to help again with water. We all scrambled like ants to get over to the pour off to begin the water hauling process. Will then headed back down canyon about a third of a mile, climbed the sloped and traversed back to camp. In this way, he avoided a dangerous climb on the side of the pour off. During the second night, we were driven into our tents by showers by 7:30 pm. Later, we were hit with high winds and rain. Not sure I have been through such hard rain in the backcountry in the past five or six years. It was pretty exciting. Both Terri and Barbara, using rocks to weigh down the edges of their tents, were holding on for dear life. We were concerned about Will, camping so close to the edge of the stream bed. He confessed the next morning that he was in his tent with his rain jacket, ready to run if the waters rose too quickly. Day 3 was the climb-out day. Basically, we retraced our steps, trying to follow the occasional cairns (really ducks) that we had set up on the way down. With one rest break and a stop for lunch, it would take us 6 hours and 40 minutes to make it back to our vehicles. Andy's photos of the trip can be found here. Terri's Photos are posted here. Our photos are posted here. And Will's photos, the most complete set, are posted here. I would strongly urge anyone contemplating this descent, or using it for part of a backpacking trip loop, to take a good look at all the photos and read the captions to familiarize themselves with the terrain. Comments and Options: I certainly have no quibble with Kelsey's books or write-ups. His work has been an inspiration for many of our own canyon backpacking experiences. But I should know by now not to assume that his experience will be the same as ours. Furthermore, in his attempt to pack in a tremendous amount of information into a small place, sometimes key facts can be missed. That is the value of a web-site such as ours. More detail and more photos. Perhaps a better way would be to go all the way upriver to Larry's canyon, and come out there, or come out the North Fork of No Man's canyon. Of course, the Dirty Devil River is a trip in itself.